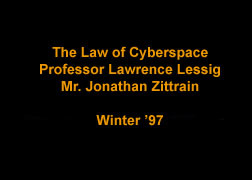 Welcome to the Law of Cyberspace Home Page! In order to enter, click on either the Graphical Page or the Text Page button above. Note on page selection: The Text Only page is intended primarily for slow links and older browers. If you had to deal with a substantial delay in receiving this page and its graphics, or if you noticed graphical anomalies or strange formatting, you may want to use the Text Only page. Otherwise, choose the Graphics page.